MOOSE TROUBLE: Moose are getting ticks at unprecedented rates, and wildlife managers fear that the only way to mitigate the damage is to keep the moose population down until the ticks start to die off. MONTPELIER — The state’s moose are struggling to adjust to higher tick levels, and wildlife managers are re-examining what moose population constitutes a healthy environment for the animal in light of the threat. In recent years, moose calves are only surviving by between 50 and 70 percent, with most of the threat coming from ticks. In neighboring states Maine and New Hampshire, survival rates are as low as 30 percent. Starting as small as the size of a grain of sand, ticks hang out at top of plants and hook onto unsuspecting moose as they walk by. During the winter they drain so much blood out of the animals that many moose die, especially the young. A single moose can carry tens of thousands of the parasites. 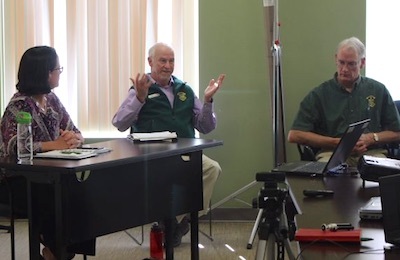 On Tuesday, Cedric Alexander, the moose project leader for the Vermont Department of Fish and Wildlife, gave a presentation on the topic at the National Life complex in Montpelier. According to Alexander, moose should be kept at controlled populations — possibly about one moose per square mile — if tick populations are ever to be expected to drop. Vermont currently has about 1,700 moose, which amounts to between 0.25 to 0.5 moose per square mile, the largest concentration living in the Northeast Kingdom. “We’re in hopes that the tick numbers on the landscape that probably developed during these prime moose years [the early 2000s] will eventually diminish to the point where the health of the moose will improve,” Alexander said. Mark Scott, wildlife director for the Agency of Natural Resource’s Fish and Wildlife Department, speaks on the struggle moose are having with ticks. He said the peak year was 2007, when there were around 4,000 moose in the state — about three to four per square mile. In addition to spreading ticks, this high population threw other parts of the ecosystem off balance because moose were overgrazing vegetation for competing species in the region. 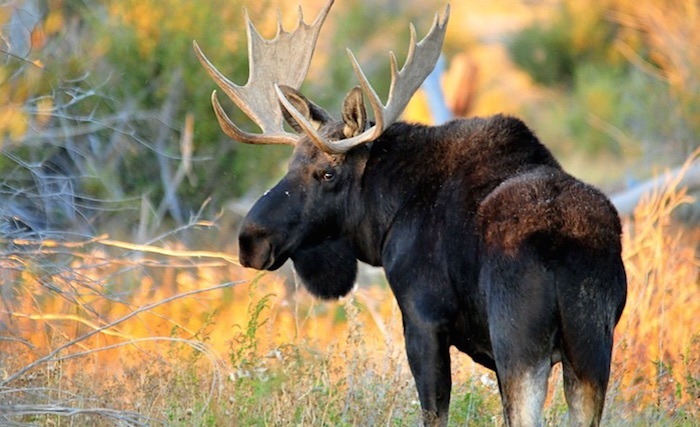 Unlike deer and other mammals, moose are unable to groom themselves to remove ticks. The parasites pile on by the thousands, overwhelming even full grown adults, which are dying off at a rate of about 10 percent per year. In the winter, female ticks grow to the size of a grape while sucking moose blood, only to fall off and lay eggs for a new generation. According to Louis Porter, commissioner of the Fish and Wildlife Department, the purpose of Tuesday’s presentation was to inform the public and get feedback. It is part of an ongoing series organized by Agency of Natural Resources Secretary Julie Moore. This past year the agency has issued only 13 moose hunting permits, with one bull moose allowed per hunter. Moose hunters generally succeed at 50 percent, meaning the agency expects less than ten moose to be hunted this year, a negligible impact on the total population. Moose populations have fluctuated in recent centuries. Around the 1830s, the herds were nearly absent from the Northeast due to agriculture-related habitat destruction. “They pretty much were wiped out of New Hampshire and Vermont, and they survived in Maine,” Alexander said. Today efforts are being made to monitor moose through electronic tagging. The Vermont Electric Power Company has lent the state a small helicopter also used in this effort. When a tracking device stops motion for several hours, it is assumed that the moose has died. A field team then heads out to check the body and investigate it for ticks and other important data. Alexander said the information gathered from field examinations has proved valuable in assessing the tick problem. For instance, in 2017 field reps tagged 30 calves, and 12 died from ticks — a 40 percent loss. In 2018, 29 were tagged and 15 died, a loss of 52 percent. Some audience members at the presentation blamed global warming for the increase in tick numbers. However, another audience member said the long winter and heavy snows this year made that theory unlikely. Alexander said the intensity of any particular winter doesn’t impact ticks because they gain warmth from their host body. However, he did say the duration of a winter can impact tick populations — for example, ticks that fall off moose in the spring are likely to die if snow cover remains through April. Alexander said while there is no immediate solution for dealing with the ticks, he added that the University of Vermont is currently studying the situation to see what ideas might work to mitigate ticks’ harmful effect on moose herds. I do believe its the population of ticks that constitutes a healthy environment for the moose. Not the other way around. I see an explosion of a ‘rationale’ for more moose killing coming up.